Germ cell tumors (GCTs) account for 95% of testicular cancers; they are divided evenly between seminomas and nonseminomatous GCTs. Testicular GCTs are rare prior to puberty. Metastasis of testicular cancer generally occurs through hematogenous and lymphatic drainage pathways. Blood born metastasis occurs most frequently in lungs, liver, brain, and bone. Gastrointestinal tract (GIT) metastasis of testicular tumor is a rare event occurring in less than 5% of GCT cases., Here, we report a case of testicular tumor presented as upper GIT symptoms, and a duodenal infiltrative lesion was seen on esophago-gastro-duodenoscopic examination. Later, a testicular mass was identified, and the biopsy result of the duodenal lesion was compatible with the metastasis of an embryonal carcinoma testis. A 28-year-old male patient presented with chief complaints of pain in the right lumbar region with radiation to pelvis for six months, fever with chills for 20 days, vomiting for 20 days, and loss of appetite for one month. Patient had a history of hydrocele for the last six months. On general examination, pallor was present with no other significant findings. On systemic examination, right-sided scrotal mass was palpated. Baseline investigations revealed raised serum creatinine; and the patient was found anemic with polymorphonuclear leukocytosis. Other biochemical and hematological parameters were within normal limits. 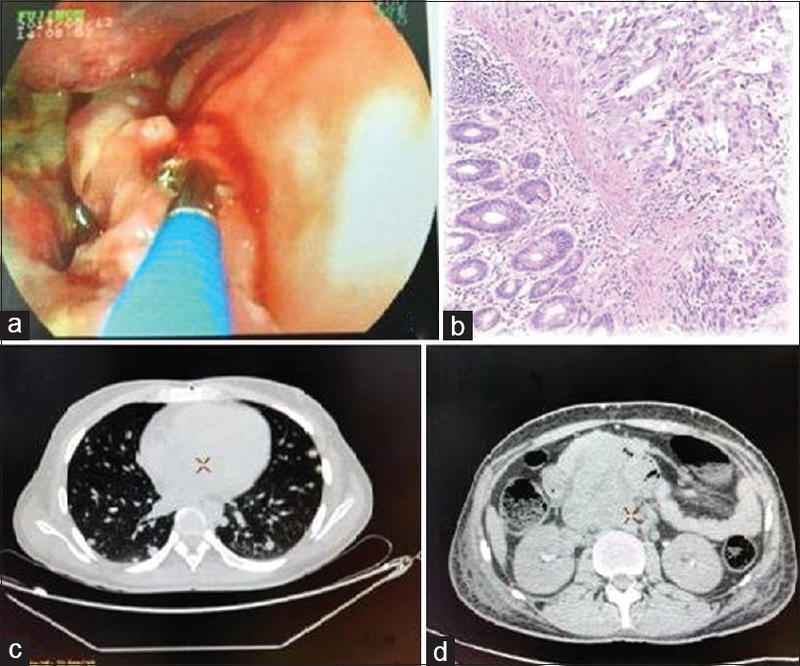 Patient underwent esophago-gastro-duodenoscopy which revealed a large, multicentric, variegated, nodular, infiltrative, ulcerative growth from D2/D3 [Figure 1]a. Biopsy was taken and the patient was referred for management of hydrocele. Histology of the duodenal infiltrative lesion revealed infiltration of tumor cells in the lamina propria and submucosa forming glands of variable size and shape and lying singly. The cells had pleomorphic, vesicular nuclei, prominent eosinophilic macronucleoli, indistinct cytoplasmic margins, and moderate amount of amphophilic cytoplasm showing both typical and atypical mitosis [Figure 1]b. Diagnosis of adenocarcinoma was made on duodenal infiltrative growth. Histopathologist was unaware of other findings at that time except for the esophago-gastro duodenoscopy report. On scrotal examination, a 7.0 × 6.0 cm mass was palpated in testis. Further investigations revealed normal serum β HCG and serum AFP. Serum LDH was raised 771 IU/l (135–225 IU/l). Patient was subjected to computed tomography (CT) scan which showed metastatic deposit in the liver and large retroperitoneal lymph nodes [Figure 1]c and [Figure 1]d. Patient underwent right inguinal orchidectomy. Right orchidectomy specimen was weighing 158.0 g and measured 7.0 × 6.0 × 5.0 cm with attached 9-cm long spermatic. On cutting, an encapsulated mass of size 6.0 × 5.0 cm involving the entire testicular parenchyma was seen. The mass was soft, granular, gray-to-whitish with multiple foci of irregular yellow necrosis [Figure 2]a. Sections from the testicular tumor showed atypical primitive cells arranged in solid, papillary, and cystic patterns with widespread areas of necrosis, brisk mitosis, karyorrhectic debris, and apoptotic bodies [Figure 2]b and [Figure 2]c. Rete testis, epidydimis, and cut margin of vas deferens were not involved by tumor cells. Based on the morphology, a diagnosis of pure embryonal carcinoma testis was considered. Sections from duodenal biopsy were also reviewed. Thereafter, sections from both the biopsies were subjected to immunohistochemistry (IHC). On IHC, tumor cells were positive for AE1/AE3, CD30, Oct3/4 and negative for CD117, PLAP, and CK-7 [Figure 3]a and [Figure 3]b. Diagnosis of pure embryonal carcinoma of testis with metastasis to the duodenum was confirmed on histology. However, unfortunately in this delay of four days, the patient developed severe pain and edema of right limb and was again subjected to CT scan which revealed large thrombus involving the right external iliac, internal iliac, common iliac, and extending into the inferior vena cava [Figure 3]c. Venogram of right limb also showed dilated venous collateral [Figure 3]d.
Immediate chemotherapy was started with the bleomycin, etoposide, and cisplatin (BEP) regimen and therapeutic anticoagulation was started. Till now, even after two cycles of chemotherapy there is no sign of thrombus regression and surgeons are planning for thromolectomy. Embryonal carcinoma testis occurs in pure form and as a tumor component in mixed GCTs. In pure form, it comprises only 2–10% while occurs as a component in more than 80% of mixed GCTs. Right side preponderance has been reported worldwide in various series by different authors. Metastatic spread of embryonal carcinoma is lymphatic first to retroperitoneal lymph nodes and subsequently to mediastinum. Hematogenous spread to the lung is generally seen. GIT metastasis occurred in less than 5% of cases of GCTs in previous studies., Prior reviews have also demonstrated that nonseminomatous GCTs are more likely to have GI involvement with embryonal carcinoma as the dominant component in most case series. The involvement of the duodenum by metastatic testicular neoplasms has been attributed to the position of its second, third, and fourth segments in the retroperitoneum where the lymphatic drainage of the testis is located. Involvement of the inferior vena cava (IVC) by a testicular tumor is a rare event. In one autopsy series of 154 patients with GCTs of the testis, IVC involvement was seen in 3% of the patients. Husband and Bellamy reviewed the CT scans of 650 patients with testicular cancer and found only 4 cases of IVC invasion among 397 patients with retroperitoneal disease. There are two mechanisms by which the IVC may be involved. The first is due to the spread of the tumor by direct invasion of the spermatic vein and then of the vena cava. That explains why IVC invasion more frequently occurs with right-sided tumors because of the direct insertion of the right gonadal vein into the IVC. The second explanation is the lymphatic spread and direct invasion from the paracaval metastatic sites secondary to the development of lymphatic-venous shunting in severe lymphatic disease. Thus, bulky retroperitoneal disease is a major risk factor for IVC tumor thrombus. The histopathological composition of intraluminal vena caval thrombosis reflects the pathological features present in the testis, most frequently embryonal carcinoma component (43.5%). IVC tumor thrombus in testicular cancer rarely regresses completely after chemotherapy and thrombus surgical resection is commonly deployed. Therefore, aggressive surgical approach before or after chemotherapy is the best therapeutic option for such patients. In conclusion, as the testicular GCT is a common malignancy in young men, patients presenting with evidence of GI symptoms with suggestions of underlying malignancy complete clinical history for scrotal/testicular swelling and a genital examination should be done for early diagnosis and prompt intervention. Siegel RL, Miller KD, Jemal A. Cancer statistics 2016;66:7-30. Jamal-Hanjani M, Karpathakis A, Kwan A, Mazhar D, Ansell W, Shamash J, et al. Bone metastases in germ cell tumours: Lessons learnt from a large retrospective study. BJU Int 2013;112:176-81. Nord C, Fossa SD, Giercksky KE. Gastrointestinal presentation of germ cell malignancy. Eur Urol 2000;38:721-4. Shogbesan O, Abdulkareem A, Jehangir A, Byreddy A, Swierczynski S, Donato A. Gastrointestinal Involvement of Testicular Germ Cell Tumor: A Case Report and Literature Review. Case Rep Gastrointest Med 2017;2017. Mostofi FK, Sesterhenn IA, Davis CJ Jr. Developments in histopathology of testicular germ cell tumors. Semin Urol 1998;6:171-88. Chandanwale S, Chawla R, Buch A, Dharwadkar A, Gore C, Rajpal M, et al. Pathology of testicular tumors-Review of 50 cases. Int J Pharm Biomed Sci 2012;3:167-76. Mazumdar S, Sundaram S, Patil P, Mehta S, Ramadwar M. A rare case of metastatic germ cell tumor to stomach and duodenum masquerading as signet ring cell adenocarcinoma. Ann Transl Med 2016;4:309-12. Jemal A, Siegel R, Ward E, Hao Y, Xu J, Thun MJ. Cancer statistics. CA Cancer J Clin 2009;59:225-49. George N, Perisetti A, Raghavapuram S, Banerjee D, Kuo E, Tharian B. Metastatic duodenal germ cell tumor diagnosed with endoscopic ultrasound. Endoscopy 2018;50:27-8. 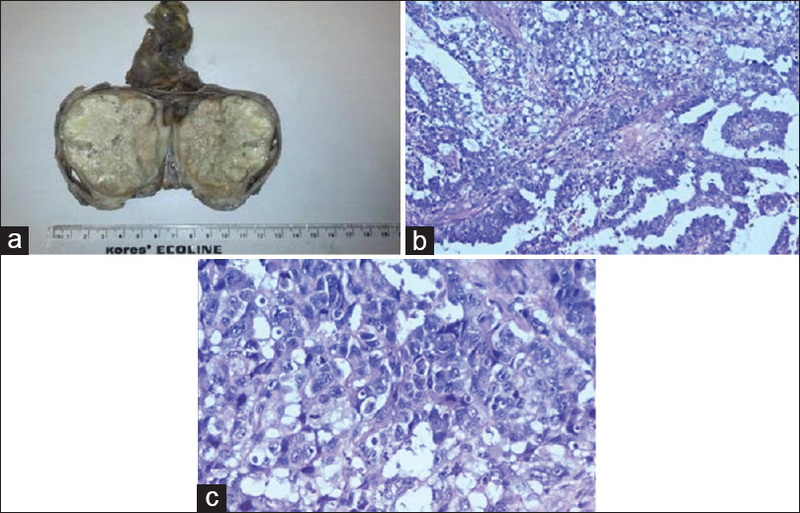 Gadodia A, Ghosh I, Prakash G, Thulkar S, Raina V. Massive gastro-intestinal haemorrhage in metastatic germ cell tumor from duodenal invasion: A report of two cases. Trop Gastroenterol 2011;32:232-4. Bredael JJ, Vugrin D, Whitmore WF Jr. Autopsy findings in 154 patients with germ cell tumors of the testis. Cancer 1982;50:548-51. Husband JE, Bellamy EA. Unusual thoracoabdominal sites of metastases in testicular tumors. Am J Roentgenol 1985;145:1165-71. 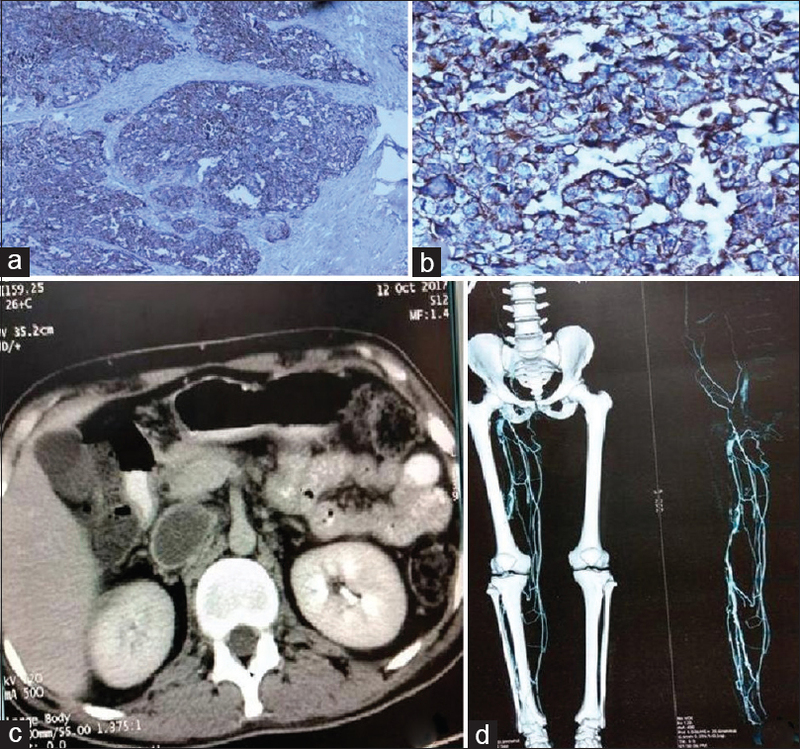 Kinebuchi Y, Ogawa T, Kato H, Igawa Y, Nishizawa O, Miyagawa S. Testicular cancer with tumor thrombus extending to the inferior vena cava successfully removed using veno-venous bypass: A case report. Int J Urol 2007;14:458-60.